As any writer or storyteller might understand, there are times when you wonder if the words you’re writing should even be shared. And this is one of those times for me. I’m scared to put this out there…but when I think about this particular piece of my story and I see the hope and redemption woven throughout it, I’m reminded that sometimes the hardest stories to tell are the ones that need to be told the most. And so I’m taking a deep breath today and sharing something with you all. It’s the really, really hard stuff that somehow turned into good…and it brings me back to God and His amazing love for me. And that’s really why I want to tell this story at all. So the month of January probably makes a lot of us think about beginnings. But lately I’ve looked at him, and between the feelings of immense gratitude and insane tiredness…it sort of hits me square in the center of my heart. And though I shouldn’t, I think about what might have never been. Because I remember that night so clearly. I was sixteen and a junior in high school. The world, at least to my teenage self, had crashed around me. The boy I liked, and had hoped like me as much, had decided he didn’t want to be with me after all. My parents were going through an awful divorce. And, I faced the daily battle of going to school in a place where I didn’t fit in. It all felt like too much to handle, and I remember that Thursday night, alone in the house on Howard Street, as the tears flowed uncontrollably, and I truly felt that for the first time in my life, I had no one. I walked from room to room, struggling to breathe, to exist…to find some shred of hope that things might turn around. And then I grabbed my car keys. Strangely enough, that rusty, ’84 Olds felt more like home than anything else. And so I started it up and sat behind the wheel. The tears and sobs continued to overtake my body as I drove on, feeling the pain seep into what seemed like every part of me. I couldn’t understand how a person could hurt so much and still survive. I remember thinking, No one will miss me. And so I hit the gas a little harder and passed the turnoff to a friend’s house. And I just kept going. Fifty became sixty and sixty became seventy, and the numbers continued to climb as my body shook (and probably my rusty, old car did, too) and my heart crumbled. At that moment, I didn’t want to live anymore, and I was sure this was it. I envisioned losing control, I looked for something to hit…I just wanted it to be over. And by all accounts, the way I was driving that night should have ended my life. I can’t explain it, and I don’t even really try to understand it. It was a split second thought…an imagining, really…of what might be someday. And it suddenly didn’t make sense to throw it all away. And so I let up my foot off the gas and slowed to within the speed limit, drove a little more, and turned around to head back toward town. 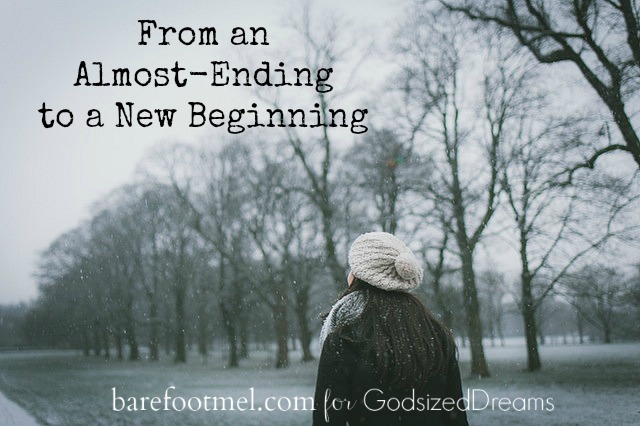 The tears didn’t stop, and the intense pain inside me didn’t let up…but somehow there was a renewed hope. I’d grown up going to church, and I knew it all…and at that time, I wasn’t in the place to just stop and give it all up to God. But that night…it was the beginning of something. It was the beginning of me knowing that I had value to Someone. The hard truth is that there will be times in life when it feels that we matter to no one. But we always, always matter to our Father. And I can’t tie that awful night up into a pretty package and tell you some radical change overtook me in an instant. All I can tell you is that I know what it feels like to hit the deepest bottom possible…and then to feel the whisper of Hope. And though it would be years before I even came close to understanding His love (heck, it’s still a daily thing for me), that night, I know without a doubt, was His whisper to me that I am loved, even when the rest of the world has let me down. And so are you, friend. It’s been almost 22 years since that cold, late-January night, and I still can’t think about it without tears welling up in my eyes. That night, I almost took the pen away from the Writer of my story because I thought I knew better. You are loved, you have value, and God has plans for you. Good ones. Don’t be afraid to let Him write your story and your dreams…the good and bad, the highest highs and the deepest valleys…because He can make them beautiful. This is powerful and I am sure there is someone who needs to read these words. The whispers of the enemy are such that we can believe them. But the truth shouts even louder…. He loves us. He never leaves us. He has purposes beyond our understanding. Blessings today! You were brave to share this, and I think it is a much needed message as to how vulnerable young people are when painful disappointments come. Two teenage girls in our community committed suicide last January, it was speculated that the final straw in both of their lives on top of other stresses, was not getting into the college they wanted and that their parents wanted. It was a shock to all of us, so yes, it is timely and God will use this, thank you. We need to pay attention to those around us. You told your story beautifully! We probably all consider suicide at one time or another. For me it was in my teens. Those feelings of being alone and no one caring can be overwhelming. It sure does help to know that God loves us forever, and will never leave us. Thanks for sharing, Mel. I am so glad you slowed down. Thank you for being so brave to share your story.